IPF-Plasson is pleased to announce the launch of their new 30-inch electrofusion coupling. ...Plasson electrofusion fittings provide a quality, tested, and field proven system for joining PE pipes in a wide range of conditions and applications. 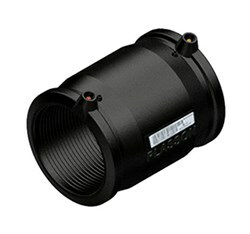 IPF–Plasson created this new coupling to address the need for high quality large diameter couplings in the industry. IPF-Plasson is manufacturing the couplings in their state-of-the-art facility overseen by quality control specialists. The 30-inch electrofusion couplings are perfect for repair applications in the mining, municipal and industrial markets. The company also offers tooling for easier installation that is recognized as one of the highest quality in the industry. The new 30-inch electrofusion coupling will be showcased at the upcoming WEFTEC Trade Show in Chicago this October. Inventory will be available for delivery at the end of August. Houston, Texas based Industrial Pipe Fittings (IPF), a Plasson owned company, offers the most complete line of HDPE pipe fittings available anywhere in the Western Hemisphere. Their capacity includes the ability to manufacture HDPE billet from which they machine large reducers, flanges, and heavy branch saddles in any diameter to 120” outside diameter. They are alone in the capacity to manufacture reducers using their exclusive swaging process. Their fittings are manufactured in strict conformance with ASTM, PPI, AWWA, API, and FM specifications. For addition information on IPF-Plasson please visit the company website at: http://ipf-plasson.com/.